This Cinnamon Honey Nut Snack Mix for SRC reveal is sweet, salty, crunchy, and delicious! It’s perfect for a mid morning bite, road, trip, or nibbles while watching a movie. It’s SRC REVEAL DAY for group D. I love love LOVE SRC! For those that don’t know, SRC (Secret Recipe Club) is a group of extremely food-thousiasts like myself. Once a month, we sign up to participate and once a month we’re assigned a fellow blogger in our group. Once we have found and created or re-created a recipe on the blog we are assigned, we create a post telling everyone about our assigned blogger, their blog, and the chosen recipe on our specified group reveal date. I’m not explaining it all that well. So, you’d better head on over to their website and read about it yourself. It’s a great way to get to know some others in the blogosphere and find some inspiration outside of Pinterest. This month, I was assigned Natural Noshing. I gotta say, I was little intimidated with all the GF ingredients and other whole food products I haven’t used or cooked with, but that didn’t stop me from trying to find the perfect recipe for this month’s SRC. I went through the recipe box and just ogled at all the delicious goodies that I was going to discover. There was the Frosty Vanilla Fig Smoothie (cause we bought a nutribullet thing), the Tropical Smoothie (see previous), Berry Pomegranate Smoothie (see what I mean?). There’s also the Quinoa Waffles, the Savory Pizza Donuts, and the Slow Cooker Moroccan Chicken Stew. I mean, there’s a huge range of recipes, flavors, and cuisines to choose from. Nora and I have one thing in common; when we were growing up, we loved cookbooks and recipes. I remember sitting on the sofa at my piano teachers, awaiting my turn, looking through all her cookbooks on the built in shelf in the dining room. She even had the Joy of Cooking! I think I read them all; or at least flipped through all the recipes. It truly sparked an interest. This, plus watching the PBS cooking shows with my father, was the start of it all. So, with all these delicious recipes at my fingertips to try, why this Honey Roasted Snack Mix? You see, with the exception of roasted chickpeas, we don’t make snacks for ourselves. I don’t know why. We just…don’t. I can only guess that’s why I gravitate toward snack recipes for my SRC reveals. And let me tell, you this one is delicious. Like, seriously, want to eat the pan delicious. I couldn’t stop snacking on it while I was cooking lunch, dinner, prep for dinner, cleaning, you name it, I was nibbling on this pan of sweet, delicious goodness. Now, I know that Nora’s blog is all about whole, unprocessed foods, but with our cholesterol issues, I swapped out some nuts for some corn cereal. I kept the almonds, but made them slivered and not whole. I kept the cashews because, well, cashews. Duh! Instead of peanuts I added Chex cereal and increased the cereal and pretzels. Oh, and added some heart healthy cinnamon to the sugar toss at the end of cooking. It’s not a lot of cinnamon. It’s a hint. A hint of enough to make this snack mix off the hook! It’s like, da bomb.com, the shiznit, the yen to my yang. You get it. No more cliché’s needed. It’s truly addictive and I’m warning you now before you nosh your way to eating the whole pan. Don’t say I didn’t warn you. See? See those shiny little crystals of sweetness? And those flecks of cinnamon right there? Oh yeah. That’s the stuff. And since it’s all tossed with some salt and sugar you get that delicious sweet and savory blend in one bite. I hope you head over the Nora’s blog and find some inspiring recipes of your own to try. This Cinnamon Honey Nut Snack Mix for SRC reveal is sweet, salty, crunchy, and delicious! It's perfect for a mid morning bite, road, trip, or nibbles while watching a movie. Combine honey and butter in a medium size bowl. Add cashews, almonds, pretzels, and Chex to the bowl and toss until evenly coated. Spread the mixture onto the baking sheet in a single layer. Bake at 350 for 6 minutes. Remove from oven, stir once and place back in the oven to bake another 5 more minutes. Spoon into a large mixing bowl and toss with the sea salt and cinnamon. Let cool completely and store in an air-tight container for up to two weeks (if it lasts that long!). Yum! This looks delicious! I don’t make snacks nearly enough. Love the cinnamon honey. The cinnamon makes them addctive! Don’t say I didn’t warn you! I can sense the danger of having this in my house already. Yum! 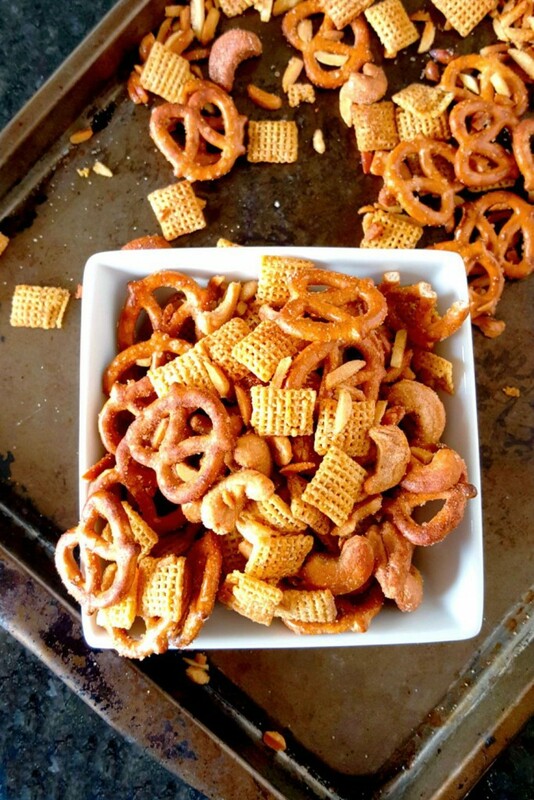 This snack mix looks amazing and a perfect salty/sweet combination! Thank you! It does have a perfect balance. I can’t wait for our trip so I can dive in! Oh heavens, this looks SO good and so addictive. I love snack mixes, and with cinnamon/honey, I’d be all over this. Awesome choice for the SRC! Thank you! I can’t wait for our trip to nibble on it on the way there. So tasty! You’ve got our two favorite flavors here – honey for my husband and cinnamon for me! Can’t wait to make this. And I absolutely LOVE that you used cashews!! I had to keep those in there. They’re like butter flavored crack in this snack mix. Just enough to add the flavor, but not too much to add to my cholesterol. 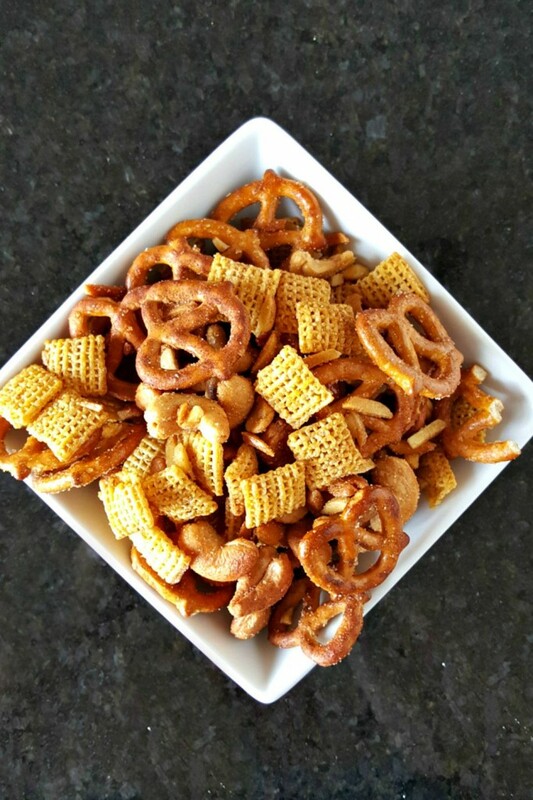 We are suckers for a good ol’ snack mix in my house..
especially during a football game;) Great src pick! Thank you! We’re snackers during games, too. Thank you, Karen! It is rather tasty. Oh my goodness what a wonderful snack mix!! This looks perfect for afternoon munchies. It is. I plan on snacking on some later today. Hehe. We don’t have all that wholesome goodness that you do. I think I have soy flour? That’s about it. I loved reading your blog, though. It was fun reading all the ingredients and reasons behind them. Oh my this looks good. I would be snacking on this immediately out of the oven and pretty much until it was gone. Happy Reveal Day! Thank you! Heh. I did nibble on it a bit while waiting for it to cool. It’s rather addictive. Thank you! I’m not usually a sweet and salty person, but it’s just enough for me in this mix. Ok, this is the type of stuff I don’t cook. Why? Because I would start munching on “just a little bit”, and next thing I know the whole baking sheet would be gone. cannot have enough of salty sweet snacks like these…. Thank you! That’s too funny about the dinner party. That’s why I cook and bring in to work. That way I get to enjoy some and it gets out of the house so I don’t eat the rest. This is the perfect snack to set out around the pool to enjoy with cocktails during this heat wave we are having. No kidding!! 102 index today alone! Thank you! We just don’t make snacks. Unless you call popcorn “making a snack.” Ours are usually in bag form. You really can’t go wrong with a sweet and salty snack mix – perfect choice! Thank you! You really can’t go wrong with a good snack mix.